The Visual Science Lab / Kirk Tuck: How to make your Canon 7D (or lesser camera) shut up and be stealthy. Cheap. 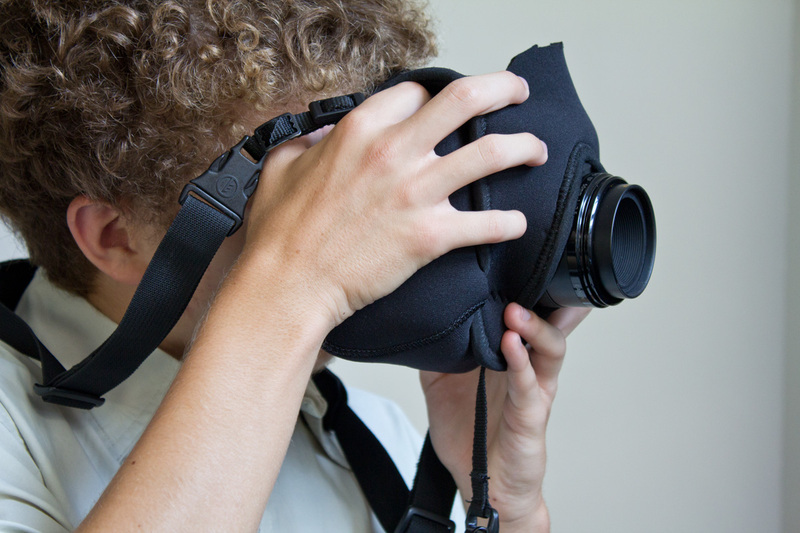 How to make your Canon 7D (or lesser camera) shut up and be stealthy. Cheap. Here's a garden variety Canon 7D . 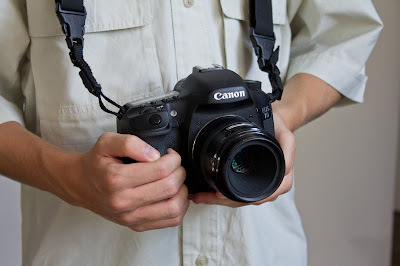 I like the camera because the shutter is already far quieter than the 5Dmk2 or the 1D series cameras and it's noise characteristic is less obnoxious than the 60D 's. But sometimes you'd like, or need, your camera to be a lot quieter, more unobtrusive. The camera as seen in the wild. Held by primo assistant, Ben. 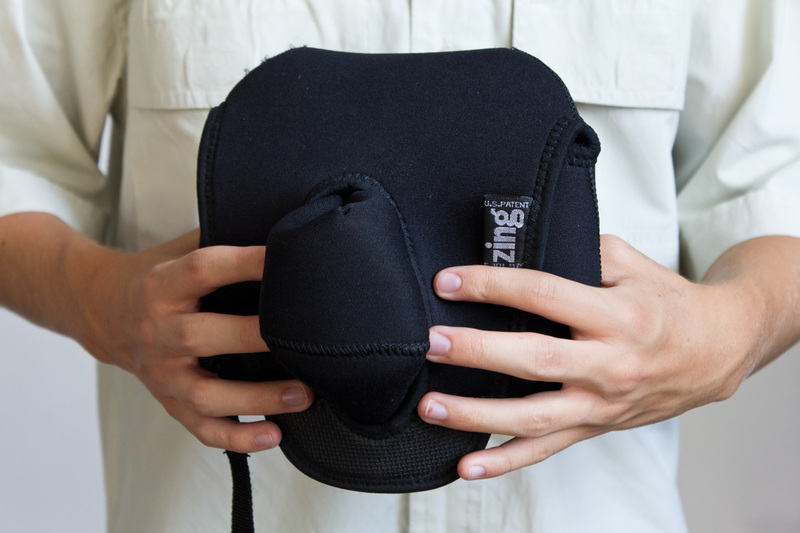 I grabbed an old Zing camera cover I'd bought to protect camera bodies back in the days when we did a lot more travel. 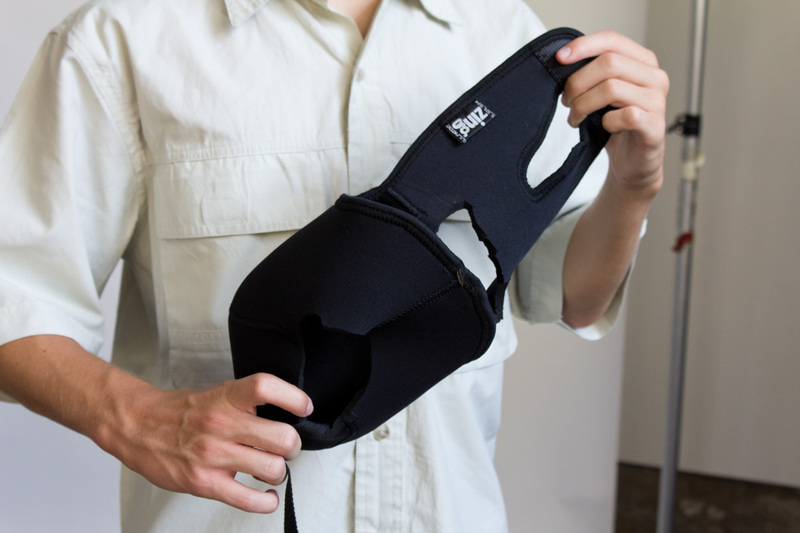 I thought the neoprene would dampen vibrations on airplanes and keep splash and dust off the machines when not in use. They worked pretty well. But we started using one expensive digital camera instead of four comparatively cheap film cameras and I stopped using the Zings . They sat in a box with other "one time use" stuff like Manfrotto tripod leg "shoes" designed so your tripod doesn't sink into sand at the beach. For a while there was a raft of products designed to fit on your tripod legs to create a little cradle beneath the center column. You were supposed to put things there you might need in a hurry. A light meter, extra film, the polaroid back or even your loupe. But as film dimmed so did the need for these accessories. The box now provides a home for small flash accessories that people sent me to test. Most were used once before I came to the conclusion that I could do this or that better with stuff that was already on the market. I called the inventors or makers and they weren't interested in paying to have the units shipped back. 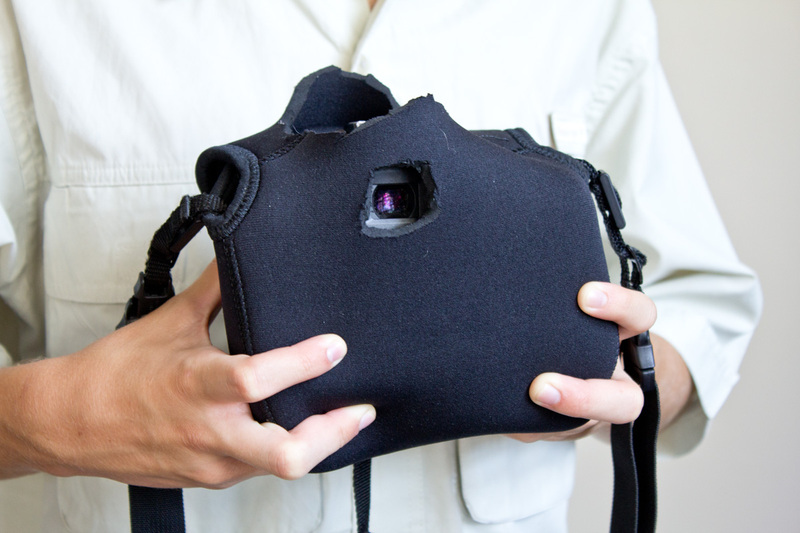 The case, as delivered, has a snout on the front that covers and protects a short zoom or normal focal length lens. 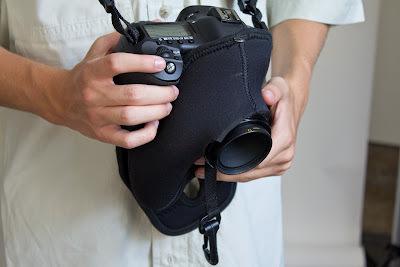 A flap comes over from the back and wraps around the lens snout to secure the packge. I took a pair of scissors and cut the snout right off. Just did it. No guilt. Actor/Model/Patient Son is showing how a lens will stick right thru the newly created hole. Anyway, I cut a hole in the Zing camera cover so the lens could stick out and then I cut a hole in the back so I could look throw the finder while the whole package is bundled up and now I have a home made blimp. It actually does a fairly good job of turning a noticeable noise into just background clutter. Here's the raw case. It's been modified before to work with a Nikon F5. See the hole just about in the middle? That was for the previous camera's finder. Amazing what you can do with stuff from the box.....and a pair of scissors. The lens is shoved thru the front opening and the rest of the case wrapped around the camera. I've cut a new opening so I can see thru the 7D finder. The case is open at the top because of my previous experiments but that works because you can look down through the top hole and see the screen for a quick preview. Finally, the whole package in the hands of an expert. There's enough play to get a shutter finger in under the top lid and enough play to reach in and make control adjustments. 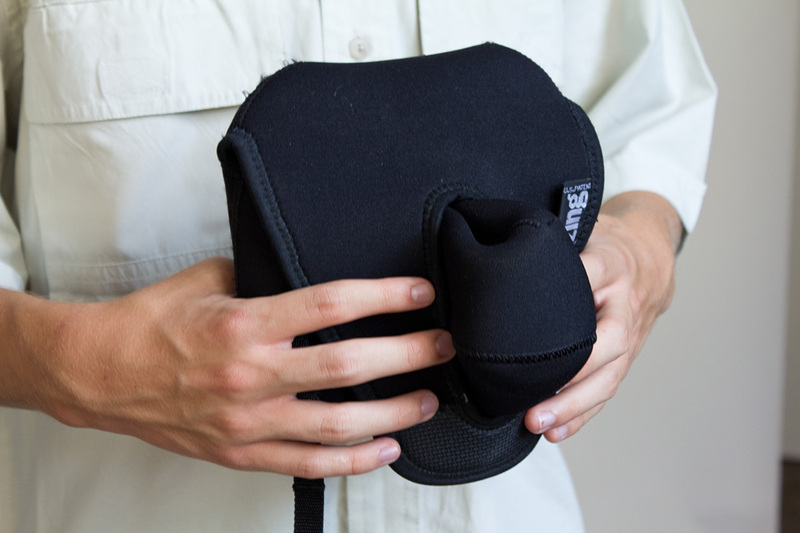 The neoprene is dense and almost one quarter inch deep so it does a good job dampening noise. It's not that much fun to shoot with but when in a stationary position it certainly serves it's purpose. And that's the whole story of the sound deadening device (SDD) that I created to shoot during a live performance at Zachary Scott Theater. You asked. I was hoping you'd post this. This will be helpful. Dude. 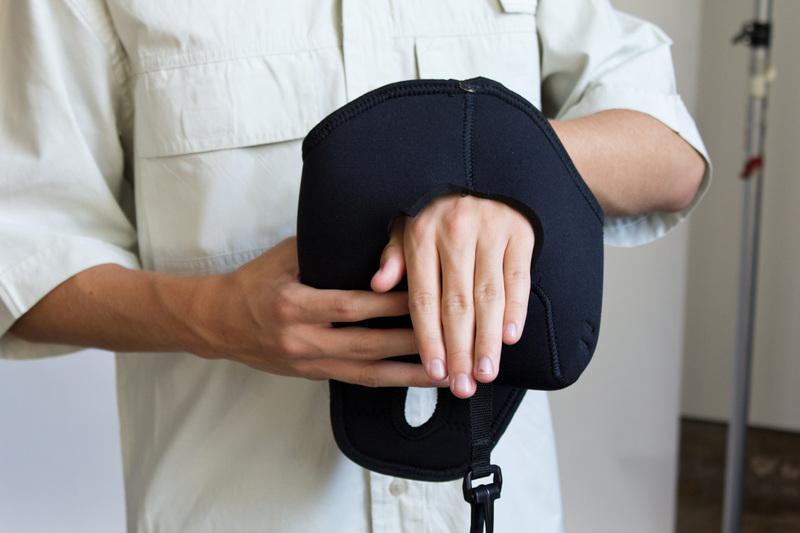 You should have these mass produced in China, and sold from your website. You'd make a fortune. Clever idea. If you have a gh2, there's a burst mode meant to give you 40 fps....in jpeg mode. It does so with an electronic shutter. If you are light on the shutter button, it will shoot one completely silent frame at a time. Not perfect, but a different way to the same goal. gosh ... well at least its not much heavier. Wonder when we'll get cameras back to being the size of the Press Graphics of yesteryear? "It will protect your camera from your sweat, and greasy fingers"
Thanks for spending the time to do this, much appreciated. Ben's first babysitter writes a best seller.